Question: Is the present 1903 White St. station the only one to stand in that location? Answer: No. There were two prior to it at the site of today's Danbury Railway Museum. Question: What are the dates for the Danbury & Norwalk RR’s Main St. depot? Answer: It opened in 1852, closed in 1903, and was razed in 1914. 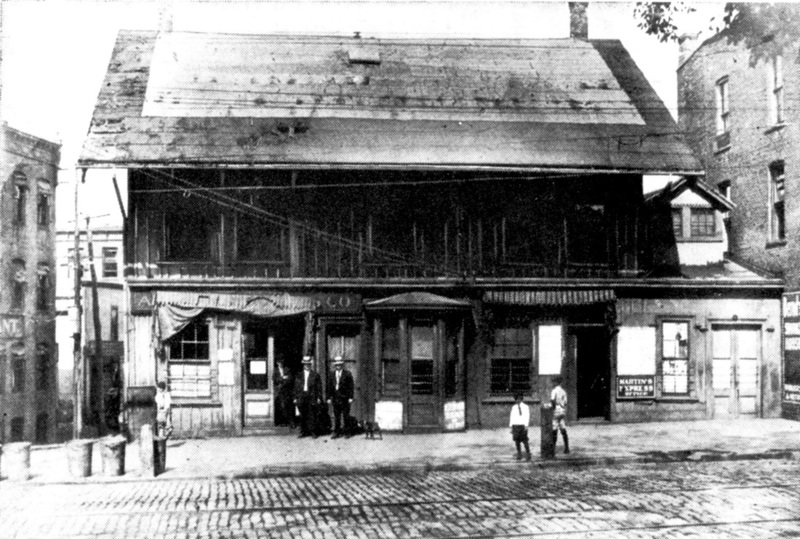 Question: Was that Main St. structure the first railroad station in Danbury? Answer: Yes. There was no earlier one behind it on Ives St. Question: How many depots have there been in downtown Danbury? Answer: Five: the one on Main St. and four on White St. Question: Did the Housatonic RR connect its track to the D&N after the 1886 lease? Answer: Yes, in 1889, by means of a trestle across the Still River. Question: When was the Danbury loop track installed? Answer: It was completed in May, 1896 by the New York, New Haven and Hartford RR. These intriguing questions about Danbury’s railroads, their depots, and their track connections have been either unasked or unsatisfactorily addressed for many years. The answers are found for the most part right where they have been buried for over a century, in local newspaper accounts. With the clarification of a few seeming contradictions, the evidence is largely in agreement on places, dates, and events. Cross-referenced with other relevant historical information, the sources all combine to tell a fascinating tale of the railroads that served the Hat City in this period. While incremental railroad development took place in many other Connecticut towns, Danbury’s manufacturing importance, its nearness to New York City, its strategic potential for traffic in several directions, and the close proximity in town of all the rail facilities that had been built independently, make this story truly unique. Date citations in the footnotes, unless otherwise specified, are to articles in the hometown newspaper that began as the Danbury Times in 1837 and, with changes of name, ran throughout this period. Event dates often differ from the article dates and, where necessary, are clarified in the text. Danbury’s competing weekly newspaper in the 1860s, The Jeffersonian, has also been checked. Clarifications and comments on this work are welcome in what, like all good history, is intended to be an evolving portrayal of past events. The scholarly exchange of this material is encouraged. For-profit reproduction is prohibited under personal copyright privileges retained by the author and TylerCityStation. [10.1.1] Danbury’s first railroad, the Danbury & Norwalk, opened its depot in 1852 where the U.S. Post Office is today at 265 Main St. The site for this station was controversial from the start. References in the newspaper sounded like the coming U. S. Civil War.1 The North and South here were borough factions, the latter of which wanted the terminus to be at the southerly end of Main St. Second-best for them was an additional depot somewhere in the lower part of town along the track that was first projected to come up along Main St. on its east side. The railroad directors settled on a single northerly depot,2 which was actually a more central location in the borough. As a result, the route was moved farther to the east to curve north around Town Hill and end with the station “fronting Main st.” on the lot owned by N.H. Wildman. 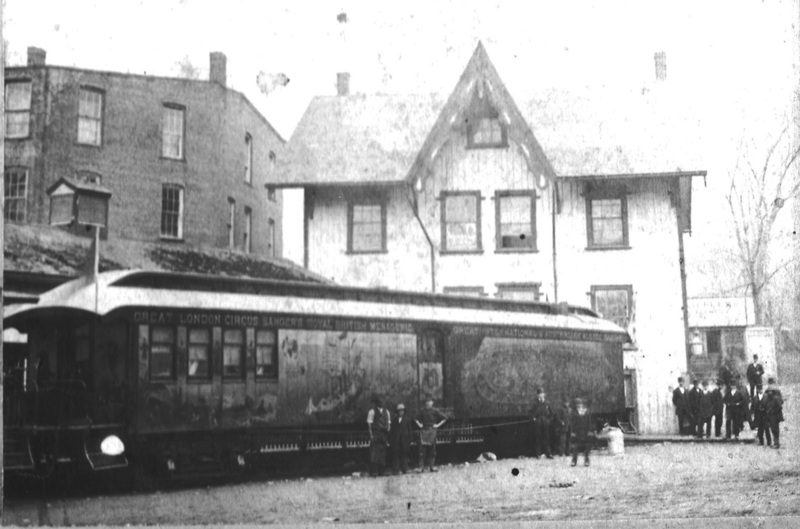 The “pioneer train” arrived from Norwalk on February 10, 1852, “reaching the termination of the track within a few rods [30 feet] of the depot.”3 Pictures show a board-and-batten building with a plain roof and a storefront-like appearance on the Main St. side.4 The pictures are reproduced below at [10.1.3] and [10.1.4]. On the back side, a tall center roof gable with teardrop-inset trim gave this depot a rural look identical to the D&N’s Bethel and Wilton structures. Access from Main St. to the platform was down steps on the south side of the building, which first stood at a level to allow trains to come in underneath. A poetic tribute to the new railroad says people “flock’d down [our italics] to the passenger cars” and later refers directly to the stairs as well.5 This evidence seems to clarify that, from the opening of the D&N, the track ended at the depot which fronted Main St. and which was not located to the rear of this property at Ives St. as some have thought. The Danbury inset from Clark’s 1856 map shows this initial arrangement accurately. Regular service commenced on March 1, 1852. As business increased, improvements were made. In 1866, the building was lowered and the bottom level was enclosed for use as a baggage area, with the platform being covered and moved eastward toward Ives St.6 The state railroad commissioners reported later that more land had been purchased to extend the yards.7 An extra track crossing Ives St. was added and facilities were expanded easterly of that street at this time. The Smith and Van Zandt map and the Beers atlas show the newer layout and even some comparative differences between their publication times, both in the year 1867. [10.1.2] This is the Plan of Danbury inset from Clark's 1856 Map of Fairfield County. The D&N comes in from the east below the Still River and ends right at the depot, 'fronting' Main St. as it has been described. The way the word 'Pasenger' is stretched out has perhaps led some to believe that the station was the small building on Ives St., a block east. Other early D&N facilities are seen along the track along the street that would be called Railroad Place, or 'Avenue' as it is seen on some maps. 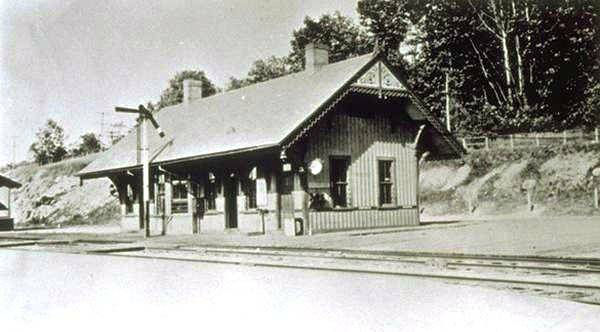 [10.1.3] This is the front view of the 1852 Danbury & Norwalk RR station, which once stood at 265 Main St. where the post office is today. This ca. 1900 photograph shows trolley tracks in the street and signage that still says Adams Express (left) and Martin's Express Co. (right). Presumably then this is prior to when this structure was closed by the NYNH&H, which opened its new White St. station on July 12, 1903. [10.1.4] The rear of the 1852 D&N station, with its gabled upper level, is similar in appearance to other D&N stations like Wilton. Click here. The car is stenciled as 'Great London Circus Sanger's Royal British Menagerie,' which would merge with P.T. Barnum's 'Greatest Show on Earth' in 1881 [click here]. An article in the Pittsfield Sun [09/11/1872/01] says this circus will "commence its regular tenting season at Danbury on the 16th of April and then proceed on an extensive tour through New England." This may date this photo to the April 1873 Danbury 'tenting.' Barnum, a native of Bethel and favorite son of Danbury, may also have 'tented' in the Hat City. [10.2.1] The NYH&N was known here by many names: the Brookfield, the White Plains, the Junction, or the Branch road, and combinations thereof, and was referred to often as the NYN&H with the ‘Northern’ and the ‘Housatonic’ reversed. These vagaries perhaps anticipated the corporate enigma it was to become. Insufficient financial support, more so on this end, was surprising in light of the road’s visionary route and good prospects and was likely due to local suspicion of an out-of-state corporation and support for the hometown D&N.17 The NYH&N would come to languish unfinished for nearly two decades, dogged by absconding contractors, preying speculators, and economic downturn in the Panic of 1873. More than once its officers were accused of improprieties that brought lawsuits, controversy, and ridicule.18 Ribbed thus as ‘The Dummy Road’ by some here like the scalawags who stole the engine’s connecting rods and ran the passenger car off the tracks, it was implored by other locals to make good its New York aspirations and boost the Danbury economy.19 Initial enthusiasm on the southern end resulted in donations of 13 acres of land in exchange for stock in the road.20 Even from the beginning, New York City was the ultimate destination and a sister company, the Southern Westchester RR, was incorporated in 1872 and was merged with the still mostly unbuilt NYH&N by the same promoters.21 They included Yale graduate George Washington Mead, an attorney, a scion of a distinguished family, and the road’s first president. Word of this promising new road even reached Europe where financing was being arranged and bonds were being offered for sale.21a Despite its limited resources, the NYH&N provided good service, with from three to five daily trains each way. It quickly cut into the business of the stage coach to Brookfield, except in periodic emergencies when the dummy was out for repairs.22 On one such occasion, Beaver Brook farmer Amos Morris and his team of oxen did locomotive duty pulling the passenger car. A woodcut in a New York periodical, reportedly Harper’s Weekly, immortalized the event.23 The dummy, a handsome machine, described as “resplendent with red paint, polished steel and burnished brass... ‘like a thing of life which is a beauty forever...’’’ sported Morris’s name and a pair of ox horns for more than a month after his service.24 In an unfortunate later turn of events, a cow belonging to the venerable “Uncle Ame” was hit on the tracks and “converted into beef by the dummy.” The same paper reports that the passenger car, refurbished in Bridgeport presumably at the HRR shops, had returned as one of the most attractive pieces of rolling stock in the state.25 Despite its rustic and, at times, almost comical nature, the little NYH&N quickly became a local transportation player in Danbury. In its first year, the little road logged 12,000 train miles, 40,685 passenger miles and 16,000 freight-ton miles, netting $6447.98.26 This works out roughly to a weekly net of $120 for six days of four round trips, 130 passenger miles, and five freight-ton miles. A meager beginning, but one not without promise. 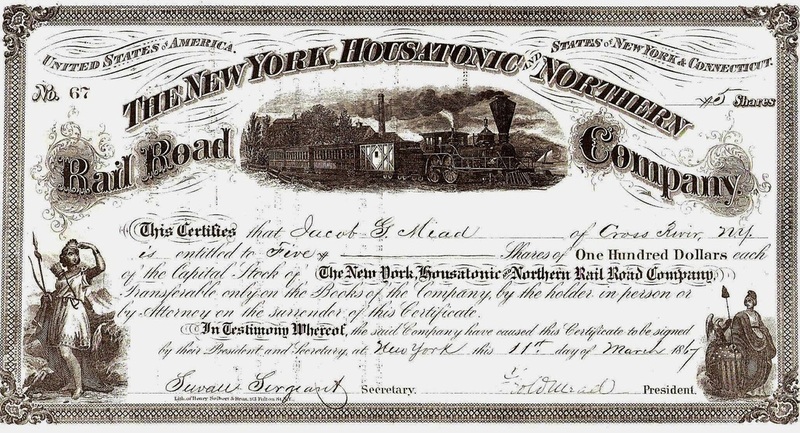 [10.2.2] This NYH&N stock certificate shows five shares purchased by Jacob Mead of Cross River, NY, one of the towns the railroad was to traverse. It is possible that the these shares were given in return for the donation of land to be part of the right of way, as mentioned above. The signatures, affixed at company headquarters in New York City on March 11, 1867, are of Treasurer Sewall Sergeant and President George W. Mead. The Mead names may not be a coincidence since other Meads known to be members of the president's family are seen on additional NYH&N documents. 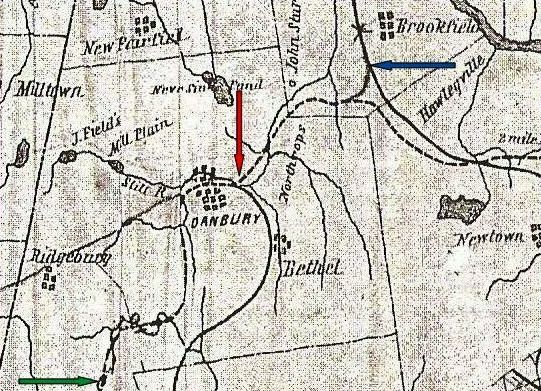 [10.2.3] Detail from Samuel Nott's 1854 map for a railroad from Danbury to Kensico Falls, which is just north of White Plains, New York. This road was to connect in Danbury with the Hartford, Providence and Fishkill RR that was building west through Connecticut. 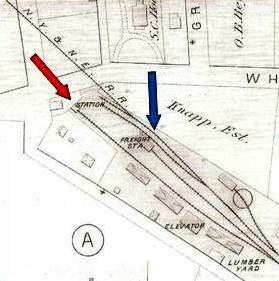 The dashed line shows the HP&F and the connection point (red arrow) with the D&N, which the NYH&N seems to have utilized in 1868. The meeting point with the HRR at Brookfield Jct. is at the blue arrow. The green arrow is the route going south out of Danbury toward New York. [10.2.4] The prospectus map shows just how the NYH&N intended to address the 'tardy and useless eastings' that the HRR route to Bridgeport entailed vis-a-vis travel to New York City. The prospectus laid out many solid reasons why the NYH&N would be a success. The HRR supported the NYH&N in spite of what might have seemed to others the promotion of competition with itself. The factors that arose to keep the NYH&N from succeeding certainly had nothing to do to the 'air line'-like route. 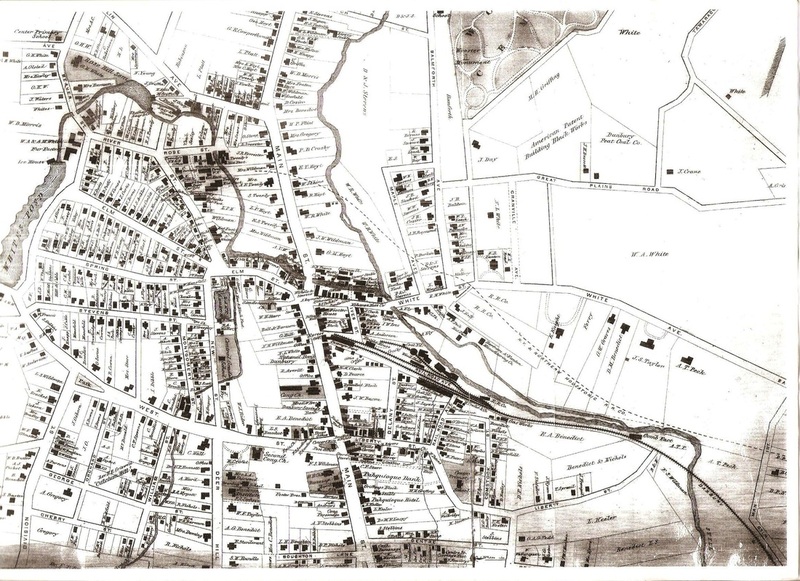 [10.2.5] This is the fold-out map of Danbury from the Beers 1867 atlas of New York and vicinity. Click on thumbnail (left) for more detail. It clearly shows the development of the D&N facilities in the decade or so since the Clark map above. Note also how the passenger shed (red arrow) now projects out from the station to Ives St. This was part of the 1866 reconfiguration. 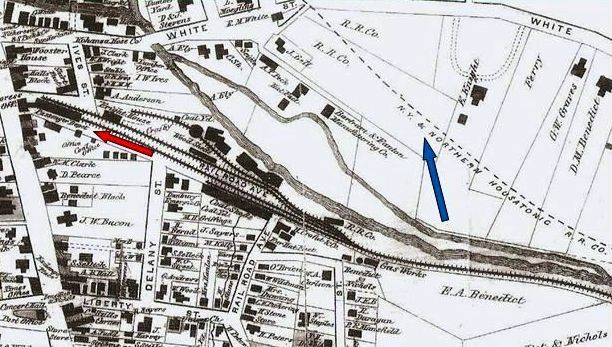 The dotted line shows the planned route of the NYH&N, which would open by September, 1868, to a point (blue arrow) in the Still River meadow near the Bartram and Fanton Mfg. Co. on Canal St. (left of blue arrow). Click here for a northward view of the factory. The train in the background of the view is on the old NYH&N. Would that the dummy were pulling it so we could have a picture! The fact that it is not the dummy dates the photo to after the 1872 HRR lease. It probably is the HRR's Useful on the job. We have not yet been able to learn the fate of the NYH&N dummy engine [add 9/20>] but we recently came across this description in the Connecticut Western News [CWN/01/19/1872/02]: "A model locomotive.-- While on the Housatonic road a few days since, our attention was directed to a peculiar looking object attached to a passenger car on the Danbury road. It had the appearance of a huge dry goods box, perhaps 10 feet square, which was perched on four ordinary car wheels, to two of which was attached a piston-rod. These two thus rigged, performed the duties of “driving wheels.” In the center of the top of this uncouth box, a six inch stovepipe loomed majestically heavenward. On each end was attached a “cow-catcher,” and a reversible head light tied on with ropes adorned to that part of the concern headed toward Danbury. This we understand is the entire passenger locomotive power of the Danbury railroad, which is said to be 5 ½ miles long. The company attempts to dignify this box by the appellation of “dummy engine,” but this scheme is too thin. A genuine, natural born dummy engine, would look down upon such a caricature as that, as a stork would gaze on a turkey buzzard." While there is a decidedly humorous touch, here we have to give credence to the details described and are in search of a photograph that approximates what the NYH&N dummy engine really looked like. If there is anyone out there who would like to draw a sketch, we would be happy to post and credit the artist. [10.2.6] Things changed quickly for the NYH&N. The Jeffersonian reports that it gave up running to Main St. and began to use its own terminus within two months, perhaps to avoid rental fees at the D&N station.27 This track terminus was in the meadow below White St. and was adjacent to the Bartram and Fanton factory on Canal St.28 A wooden engine house was relocated to this spot on the north side of the track, presumably from a more easterly location in the meadow, at this time. While a bit difficult to visualize precisely, the newspaper says this was done by jacking it up and running the dummy under the building to move it.29 An important later newspaper article entitled “The New Railway Deal” says the NYH&N’s first terminus was “in the shelter of a discarded freight car... in the lots at the upper end of Canal street, then a mere a cow path. This is as far in its struggle to reach White street... as its material would permit..."30 The History of Danbury by James Montgomery Bailey, famed far and wide for his wit as 'The Danbury News Man' and editor of the Danbury Times, concurs,31 as does a map drawn by O.H. Bailey (no relation). The NYH&N erected a small depot, mockingly called a “little shanty,” Danbury’s second railroad station, at this terminus early in the next year.32 Late in 1869, this depot was “improved and made comfortable.”33 One was erected at Brookfield Jct. as well, replacing the large tree that first served the purpose there. Responding to the call to extend the Danbury terminus the short distance to White St., the NYH&N did so late in the next year and moved the 'shanty' at that time to a parcel purchased from a Mr. Joseph Bell.34 A shed was later put up over the passenger platform.35 The fold-out map of Danbury from the 1867 Beers atlas shows the NYH&N already owning large tracts of land here. 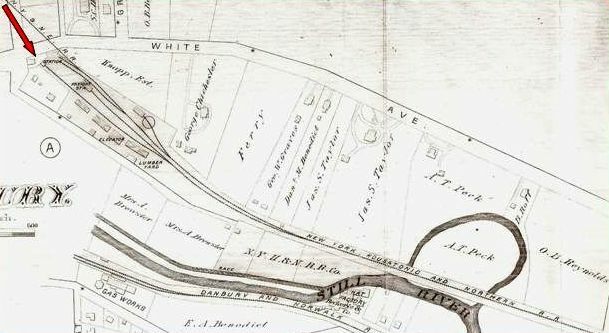 L. Peter Cornwall puts the NYH&N station on Balmforth Ave., but he says north of White St., perhaps unaware there was a short piece of Balmforth going below White and ending at Canal St.36 With this in mind, it seems certain that the “shanty” depot ended up standing at Canal St. and Balmforth Ave., just south of White St., more or less just where the 1903 NYNH&H station, now the Danbury Railway Museum, stands today. [10.2.7] The question of the removal of the link with the D&N has evaded answer thus far. Cornwall reports the move with amazement and implies that it came about early on.37 The “New Railway Deal” article seems to time the event to the NYH&N’s use of its own terminus, which, as reported elsewhere, came by December of 1868. The only later mention of the link is in June of 1869 and is merely as a geographic point of reference.38 Probably only intended as a temporary means to move construction materials for the new road - the NYH&N did intend to go into New York on its own track - the link was already gone. 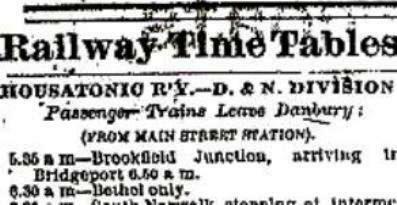 The intermittently advertised and often loosely coordinated ‘connections’ with the D&N ended in May, 1871, the last being for the D&N’s midday, southbound train. After the NYH&N started using its own terminus, passengers apparently just walked the short distance from White St. to Main St. For as long as the link was in place, however, it may have figured into a play for a lease, most likely aimed at the HRR. This was probably not the NYH&N’s original intent, but the cash-strapped road needed the income as well as the improved stature with investors to fund completion to White Plains. Some say the upstart NYH&N was held in disdain by the other roads.39 Certainly this was true of the D&N. It had aligned itself with the New York & New Haven RR and the city of Bridgeport to oppose the NYH&N charter bill in the legislature, all three fearing its diversion of rail traffic at Danbury.40 The HRR, on the other hand, had backed the NYH&N, apparently gambling that the White Plains connection would mean more than enough traffic to offset that lost for it to Bridgeport. Within a few months, the HRR was allowing the NYH&N to book passengers through to Albany and traffic connections to the north were increasingly emphasized in its schedules.41 The 13x30-ft depot that the NYH&N began to use shortly at its upper terminus was in fact the HRR’s old Stockbridge, Mass. station, donated and reassembled by the HRR for the use of both railroads at Brookfield Jct.42 The next year the HRR lent use of its locomotive Fairfield while the dummy was out of service.43 The NYH&N in turn may have given up the link to make itself a free agent and available to the HRR to compete with, and not lose business to, the D&N.44 Running its own trains directly into Danbury, the HRR would also no longer have to rely on stage connections to Brookfield and Hawleyville. For the D&N's part, it might have wanted the NYH&N as a branch to Brookfield, but it had no interest in the entire road and thus pursued an independent, defensive strategy. 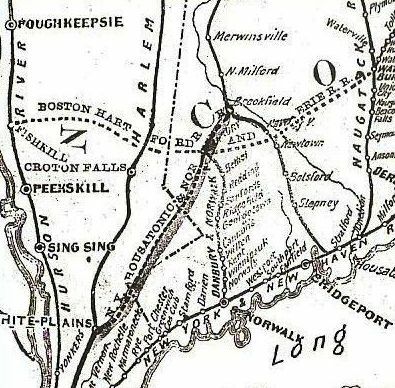 It built a 4-mile spur into Ridgefield in 1870 to offset other roads, the NYH&N among them, projected to come through that town, and a Bethel branch debuted in 1872 to meet at Hawleyville with the HRR, with the Shepaug RR for its Litchfield traffic, and with the Boston, Hartford and Erie RR, which was being built from the east. With all these developments taking place, the HRR made a move to shore up its own position. [10.2.8] 1868 broadside advertising the NYH&N at its opening. There were five daily round trips between Brookfield Jct. and Danbury. Note the D&N depot reference showing that the track connection between the NYH&N and the D&N was in place at the start. The reasons for its removal and the exact date are still shrouded in mystery. The full-size locomotive and string of passenger cars were stock advertising representations and perhaps delusions of grandeur for the NYH&N. The dummy engine and its single passenger car probably looked closer to what is seen in this link. Click here. [10.2.9] This is a close-up from O.H. Bailey's 1875 bird's-eye map of Danbury. Click here for the full map. Farther to the east, this track is labeled as HRR and this shows the terminus inherited from the NYH&N. 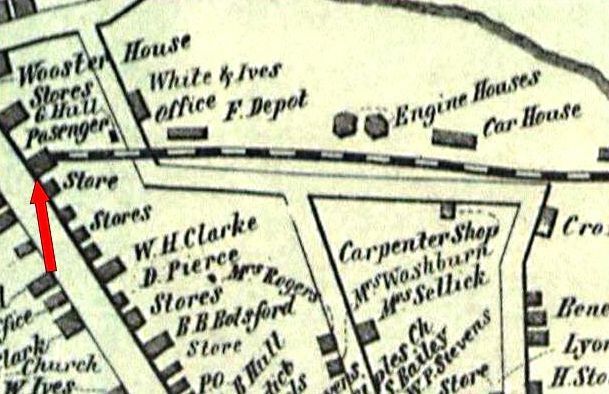 The 'shanty' depot may be the tiny building at the red arrow, still alongside the engine house and not quite at Balmforth Ave. (yellow arrow), as seen on the better-detailed 1880 Hopkins map below. This, plus the lack of the rest of the HRR's 1872 reconfiguration with new engine house, turntable and Canal St. freight house, as seen on the Hopkins map, makes Bailey's map more likely reflective of 1870 than 1875. 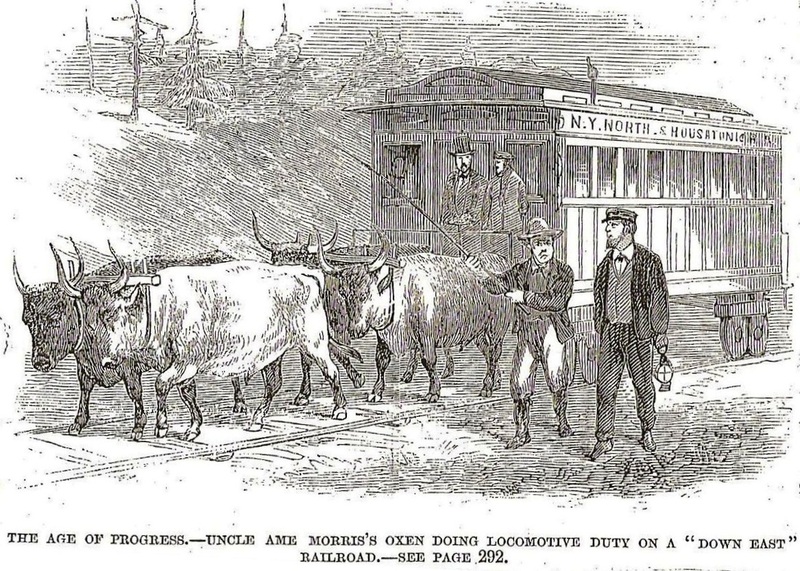 [10.2.10] An 1870 wood engraving showing Amos 'Uncle Ame' Morris and his team of oxen taking over for the dummy. This was said to have appeared in a New York periodical, reportedly Harper's Weekly. A painstaking search of all three Harper's magazines, as well as other periodicals being published at the time, has not found the actual issue in which this was printed. The quest continues! Note the erroneous 'New York and North. Housatonic' on the passenger car. [10.2.11] Amos Morris, still looking handsome and fit at an advanced age, and a man of some stature, hardly the short, bumpkin farmer shown in the woodcut above. He served for just a few days in the War of 1812, was suddenly awarded a pension late in life and was rather amused by it. 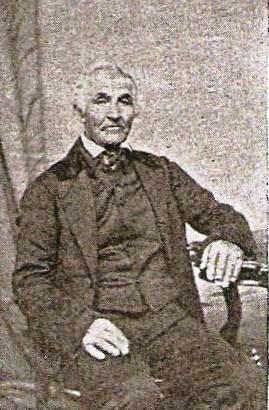 He lived to the age of 96, and died as Danbury's oldest resident at the time. His obituary was carried far and wide. He was a great story teller and colorful figure, who reportedly took great pleasure in showing visitors the woodcut hanging over his fireplace, depicting himself and his team of oxen pulling the NYH&N passenger car. The day his obituary appeared in The Evening News [DEN/08/12/1886/01], an article entitled "The Danbury Railway Lease" ran just below it to announce the HRR deal to take over the D&N. 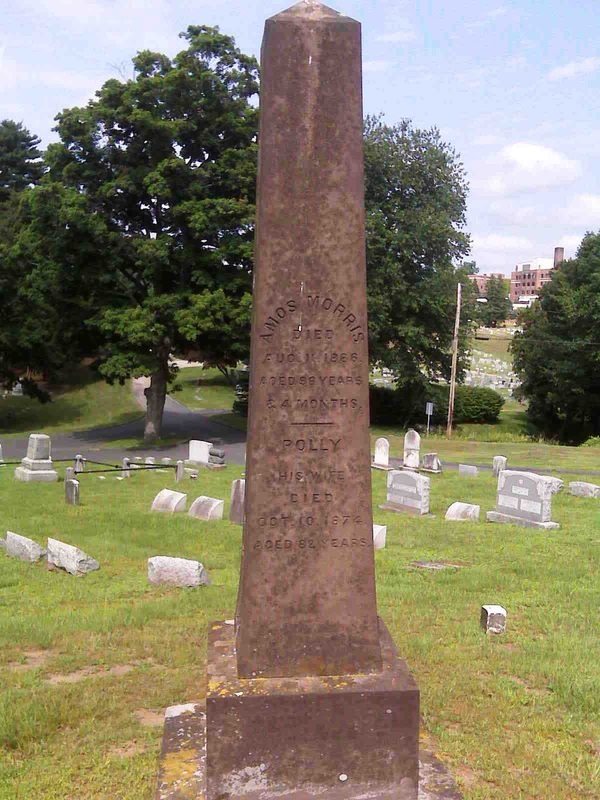 [10.2.12] Amos Morris, at rest in Wooster Cemetery in Danbury, Section I, if anyone cares to pay him a visit. We had hoped to find some indication of his heroic service for the NYH&N on his obelisk. His obituary, on the front page of The New York Times [NYT/08/13/1886/01], says he "made himself locally famous when the first passenger train was started over a railroad running into Danbury. The single car couldn't be got up the grade until Uncle Amos hitched his oxen to it and pulled it up the incline. This feat earned a picture in Harper's Weekly." It has yet to be found anywhere from 1868 to 1872 or so in any of the Harper's magazines. [10.3.1] On March 1, 1872, shortly before the opening of the D&N’s Bethel branch, the HRR leased the NYH&N’s finished portion.45 Almost from the start this little line had been proving its worth. Entrepreneur Isaac (Ike) Ives, uncle of Danbury composer Charles Ives, had his lumberyard behind the D&N station on the street named for the family, but Ike was also adjacent to the NYH&N terminus. He began getting wood shipped from Bridgeport via the HRR and the NYH&N instead of via the D&N. Tweedy & Co., one of Danbury’s many hat firms, started receiving some of its coal, and other businesses were getting goods via this new routing also.46 As lessee of the branch, the HRR started to compete more vigorously with the D&N.47 The HRR quickly cut fares to Brookfield in half, lowered fares to Bridgeport, and began mail service on the line.48 Competition with the D&N, however, was still keen. Ads boasting that eastbound passengers saved an entire five minutes going to Bridgeport on the HRR instead of via Norwalk showed the fight for every customer, but, with its wider reach and greater resources, the odds were certainly in the HRR’s favor.49 As the value of the branch increased each year, the HRR could only want to buy it outright and ultimately purchased it in a proxy transaction with its own president, William H. Barnum. He had bought it on May 6, 1881 “as Trustee for” the HRR50 from a Mr. John N. Whiting, an attorney. Even at this late date, Whiting was said to be interested in completing the NYH&N all the way to New York City.51 This was a surprise to many. Eight years earlier, the Eastern States Journal, a White Plains newspaper, had said sarcastically that unless President Mead had discovered a new arithmetic that “changed 0+1 into untold millions,” there was no hope.52 Bankruptcy, in fact, did come in 1875 but so did reorganization and Connecticut legislative extensions all the way up to 1881. On the eve of this resurrection, Whiting cashed in and broke the NYH&N into pieces, selling the branch to Barnum for $65,000 and the unfinished portion to another party for $150,000. The combined sales prices were nearly twice the $111,000 purchase price paid in the 1880 foreclosure auction and it has never been determined if Whiting or others were ultimately behind all these transactions.53 One does wonder how the only profitable asset of a bankrupt railroad could enrich another company for years and then be lopped off and sold to that company’s president for a relatively small sum. 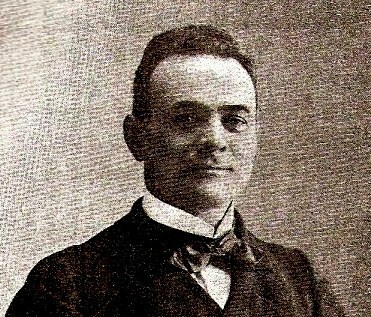 An unsuccessful motion to vacate the sale to Barnum was made by the bankruptcy trustees, who, curiously, were some of the railroad’s own officers. The Danbury newspaper commented that “as long as ... [Mead and company] are alive we shall not cease to hear of trouble” with “The Dummy Road.”54 These unseemly repercussions probably dissuaded the HRR from acquiring the rest of the line to White Plains, in spite of the fact that the grading on the 23 miles in New York was largely complete and the HRR appears to have had the legal right to finish the project.55 The only certainty in all of this is that the wily William H. Barnum, astute businessman, influential national political figure and former U.S. senator, and cousin to showman P.T. Barnum, had succeeded in pulling off what the D&N had not been willing or able to attempt: just buying the operational part of the NYH&N and ditching the rest. By this time Danbury was said to have become the busiest HRR station, second only to Bridgeport itself.56 Barnum conveyed the branch to the HRR on October 9, 1882 for the $65,000 he had paid,57 and, though other roads would later attempt to replicate its route and concept, the NYH&N ended here as a viable legal entity. Aided by the ownership of its Brookfield branch, the HRR would continue to prosper, do battle with the D&N, and finally lease it in 1886. [10.3.2] Improvements on the NYH&N property in Danbury took place both with the HRR lease in 1872 and also with the purchase in 1882. The newspaper said that the lease “will work a revolution in the management of the Brookfield branch” and that a passenger building, freight depot, and a new engine house were to be built “at once.”58 A full-service locomotive, the Useful, was already running on the line early in 1872. This small 1871 HRR-built 4-4-0 replaced the dummy engine,59 presumably until the bridge over the Still River near Brookfield was strengthened and heavier locomotives could be used. The changes in Danbury can be seen in detail on G.M. Hopkins’s 1880 map. Track ends as a west-facing railhead at the large street plaza between Canal St., Balmforth Ave., and Maple St. Below it 1,200 feet of new iron lead to a turntable and new engine house north of the track and to a new freight house on the Canal St. side.60 A small passenger station stands right at the plaza. This is still the NYH&N’s 1869 “shanty” and not the HRR’s promised new station, which, as late as 1880, the newspaper says the HRR had not built.61 That new one, finally erected in late 1882, was a 58x22-foot structure. It had platforms all around, a bay window at track side on the north, and a carriage stand on the south side. Inside, there were separate men’s and women’s waiting rooms and a baggage room. After complaining for years about its passenger facilities in several towns, the railroad commissioners complimented the HRR on “the new and commodious station building” at Danbury.62 The HRR also added onto the freight building making it 108x24 feet at this time.63 A picture of the freight house prior to expansion is in Cornwall.64 The costs of these improvements were $5,000 for the passenger depot and $1650 for the addition to the freight house.64a The “New Railway Deal” article says that now, in 1886, a “large and handsome station grases (sic) the site of the shanty” and that the meadow, “covered with track” by this time, was no longer the obstacle to the NYH&N it once was.65 The latter has to be read broadly since, by the article’s own account, the “shanty” had been at White St. since 1870. The article also clinches the progression of structures at this site from the “shanty,” to the 1882 HRR depot, and later, as we know now, the 1903 NYNH&H station. [10.3.4] The Useful was built by the HRR in 1871 and first used on the Brookfield branch after the 1872 lease of the NYH&N [HDC/11/04/1872/04]. 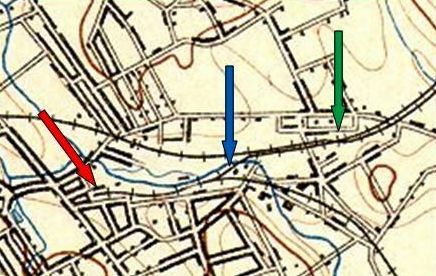 The maps below show the location of the 'shanty' NYH&N depot at White St. (red arrow) and the likely setting (blue arrow) for the shot at the left with the engine alongside the HRR freight house that was built late in 1872. [10.3.5] The 1880 Hopkins atlas of Danbury shows the situation on the eve of the completion of the NY&NE. The track of the NYH&N is shown still belonging to that road, though under lease to the HRR. 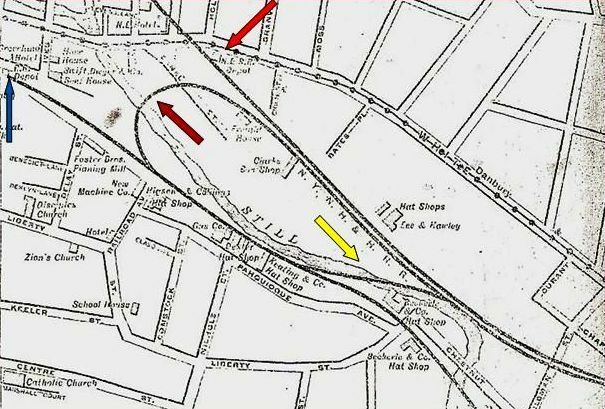 Note the location of the NYH&N 'shanty' depot (red arrow) at the end of the track at White St. and the expanded trackage and facilities which the HRR had put in since 1872. The NY&NE temporary track crosses White St. in the upper left, and would become operational with the road's opening in 1881. 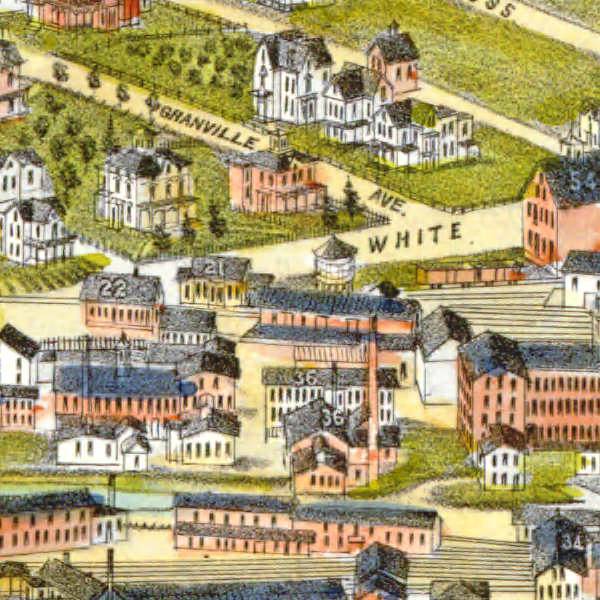 [10.4.3] This is a shot from the 1884 Burleigh bird's-eye map of Danbury. Click here for the entire map. The map key identifies building #22 as the HRR station (built in 1882) and building #21 as the NY&NE station (built in 1881). The HRR freight house is to the right of the 1882 station, showing its increase in length from the addition put on by the HRR in 1882. The 1852 D&N station is out of sight to the lower left and the New England Hotel is out of sight just west of the NY&NE track crossing White St. See the next item. The bird's-eye artist has accurately captured the stations' features, especially the distinctive wings of the NY&NE depot. [10.4.4] This is an advertisement from the 1887-1888 Danbury city directory. Proprietor C.F. 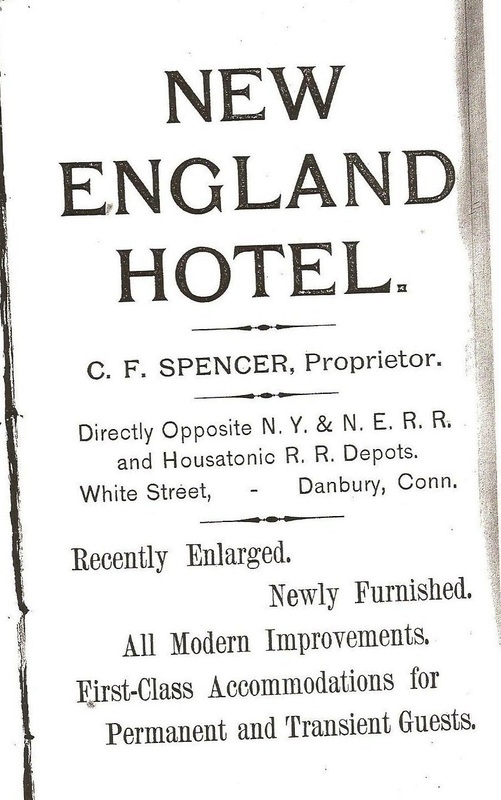 Spencer boasts of the location of his New England Hotel right across the street from the HRR and NY&NE passenger stations. Unfortunately for him, this would change on March 17, 1889 when the HRR would move its station to Brookfield Jct. and run all trains here into the 1852 D&N Main St. station, a few blocks away. The White St. site would remain empty until the NYNH&H opened its own station there in 1903. [10.4.6] This is the 1882 HRR Danbury station that replaced the NYH&N's White St. 'shanty' depot, the fate of which is not known. When this 1882 station was built, the NY&NE depot, pictured above, was already standing across the tracks, as shown in the Burleigh map. We have not yet found any actual photos of this station standing on White St. The structure was moved on March 17, 1889 to Brookfield Jct., where it is seen here. The move was after the HRR installed the link that would allow trains access from the north into the D&N Main St. station, thus making their White St. station redundant. This station stood until at least 1934, its fate thereafter is not yet known. See Track 9 for more on Brookfield. [10.5.2] With the link stalled here, another plan was quickly put into play, possibly with an eye toward working one location against the other. This alternative strategy was to reconfigure track at Hawleyville and install a connection there instead. The HRR had, of course, acquired the six-mile D&N Bethel to Hawleyville branch with the 1886 lease. The jointly built branch had been financed by the D&N but operated by the Shepaug, which was paid for handling D&N traffic on the line.81 Apparently, the high land prices in Danbury did not come down by the summer of 1887 and the HRR decided to go ahead with the Hawleyville plan.82 It proceeded to install a quarter-mile piece of track there allowing through trains to completely bypass Danbury. Hitherto, coming into Hawleyville from the south, trains could only head into an east-facing connection with the HRR or cross over it onto the Shepaug. The new track would turn HRR trains west and then north around Danbury. This piece of track also served as the west leg of a wye to facilitate directional changes for other trains as well at the important junction that Hawleyville had become. Tentatively touted as a cheaper alternative to the Danbury link, it turned out not to be. The newspaper pointedly remarked that the work there required a half-mile of fill up to 22 feet deep and a stone arch bridge as well.83 The project was nonetheless completed by the end of the summer of 1887. 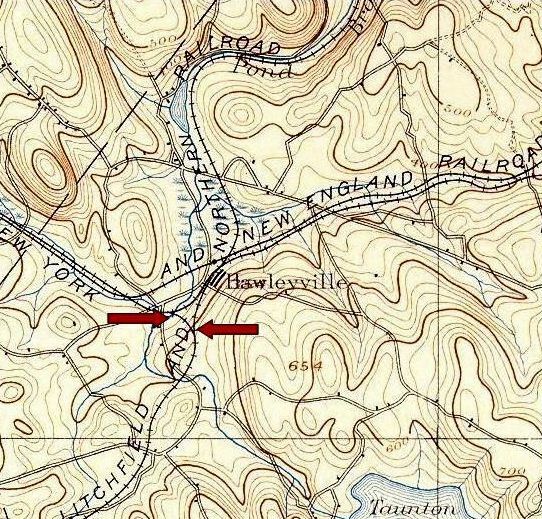 [10.5.4] This shot from an 1892 topographic map shows the situation at Hawleyville in that year and as it had existed since the installation of the 1887 link by the HRR, as marked by the arrows. This was to enable trains to bypass Danbury because of a lack of a link there to connect the HRR's leased D&N and with its Brookfield branch, the former NYH&N. 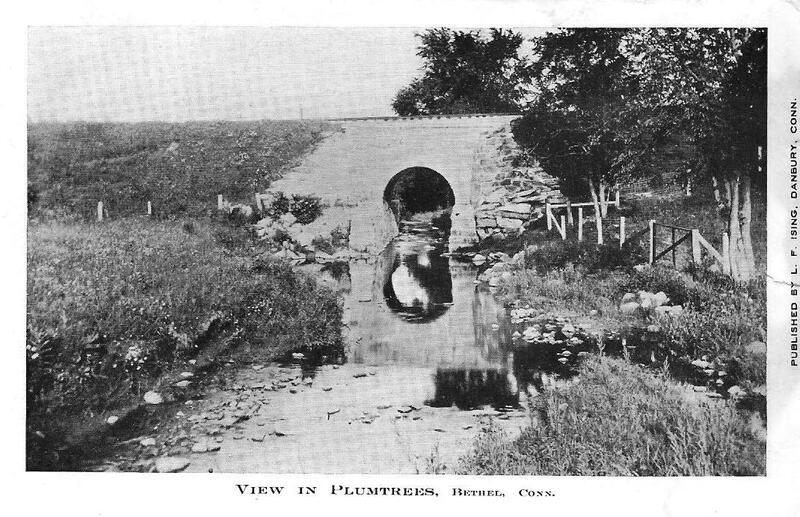 The image at right is of the Plumtrees culvert on the Bethel branch. This would probably be off the lower left corner of the topographic map. [10.6.1] It took a new HRR vice president and general manager, the dynamic William H. Stevenson, to make the Danbury link happen. 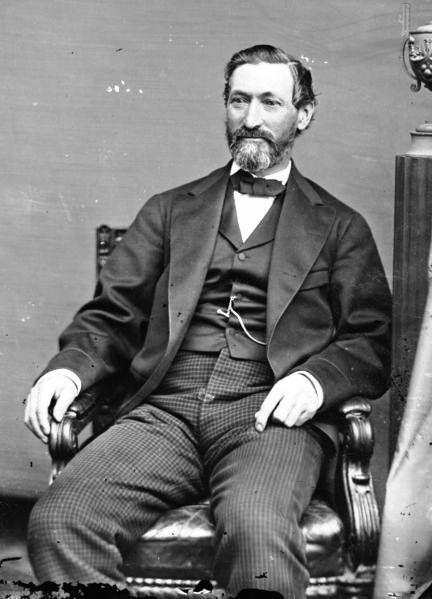 Stevenson had started his railroad career working as a clerk for the HRR in Bridgeport, and had moved over to the Consolidated, becoming superintendent of its New York Division in 1882. By 1887 he was with the rival NY&NE and his HRR appointment began a spirited effort to strengthen that road.89 This, of course, included extending the HRR into the Elm City itself by buying the only railroad there that the Consolidated did not control, the New Haven & Derby, and cleverly connecting it to the HRR at Botsford. This gave the HRR a tidewater outlet in New Haven, in addition to Norwalk and Bridgeport, and even more east-west traffic. The outright invasion of its capital city may well have been the last straw in persuading the Consolidated to put an end to the HRR. Stevenson realized the need to deal with the Hawleyville bottleneck. Improvements, as requested by the commissioners, were made on the branch but he also saw the Danbury link as part of the answer.90 Coincident with the formation of the New England Terminal Company, Stevenson arrived in Danbury in December, 1888 with surveyors who quickly located a point in the meadow for the connection between his D&N and HRR lines. Land north of the Beckerle factory, which was at the corner of Liberty and Chestnut Sts., was purchased within a week for a mere $3,000 and, in spite of the ice and snow, work commenced immediately.91 Trees were cut, timbers and rails delivered, and gravel was being poured.92 On January 9, 1889, the last rail was spiked down in heavy rain. The work centered mostly on the 800-foot trestle over the swampy, flood-prone land. Because the actual crossing of the Still River was on a diagonal, the paper says the trestle appeared to be S-shaped when viewed from the approaches. HRR engine #19, the W.D. Bishop, named for the first NY&NH president and son of HRR founder Alfred Bishop, made the initial crossing.93 After a twenty-year absence, the link was back in and the stub-end tracks were again connected. [10.6.2] The energetic William H. Stevenson, vice president and general manager of the HRR and also president of the New Haven and Derby RR. Stevenson was the moving force behind the NH&D Extension that would open new markets for New Haven goods in Danbury and beyond. He also completed the reconnection of the old NYH&N with the D&N in January of 1889 via the link shown on the map below. 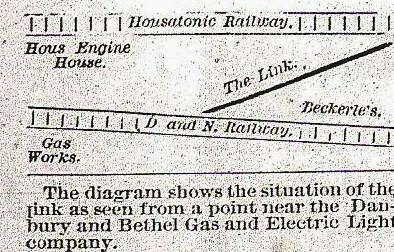 [10.6.3] This schematic map appeared in the Danbury newspaper [DEN/12/18/1888/08] and shows how the HRR track, formerly the NYH&N, and the D&N were to be reconnected. The original link was just east of here at Nursery Ave. It took 800 feet of track and trestle to complete the angled crossing of the Still River here, causing the newspaper to say that it looked like an S when viewed from either end. [10.6.4] The Evening News of Tuesday, February 5, 1889 gave the first newspaper timetable with all HRR trains now leaving from the Main St. D&N station. [10.6.5] Pictured to the right is the W.D. Bishop, HRR locomotive #19, at an unknown location. 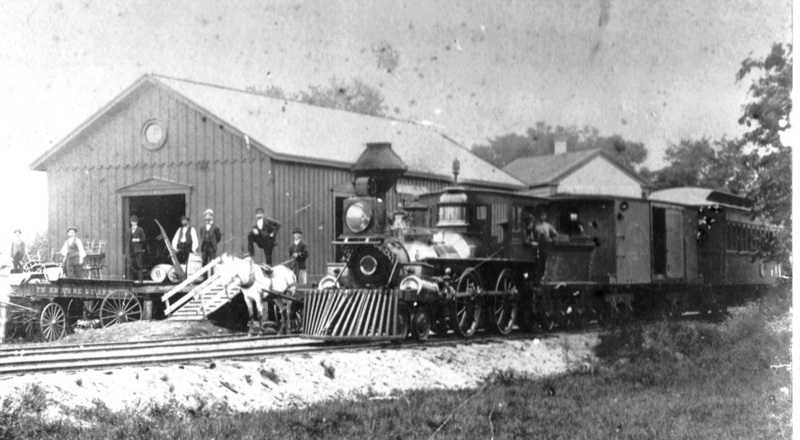 This was the first engine to utilize the 1889 link in Danbury that reconnected the NYH&N with D&N. [10.6.6] The HRR lost no time in streamlining operations to capitalize on this feat. The paper reported that all passenger operations, with some 32 daily trains, would now use only the Main St. station.94 The first branch train crossed the new trestle on February 1, 1889. At the same time all freight operations were to be moved to the HRR’s White St. yard. No plans were yet indicated for the either the D&N freight house on Railroad Place or the HRR’s 1882 passenger station on White St., now both unneeded. It was said that the freight house might be moved and joined to the White St. freight facility but an 1897 Sanborn map shows the D&N building still at the old location. The passenger station was, however, another matter. Already rumored at least two years earlier, there was talk again at this time of a new union station to be shared by the HRR and the NY&NE.95 Perhaps this was part of some master plan on Stevenson’s part. In any case, the existing passenger station did not fit into the grand scheme. It was moved to Brookfield Jct. on March 17, 1889. With a large crowd watching the show, 50 men loaded the 50-ton structure onto a train of two flat cars pulled by HRR locomotive #8. Lashing it to a car on the adjacent NY&NE track helped get it to the Beaver Brook district where the HRR consist cut loose and curved northward up the branch with more precarious adventure to come, including a pass by the hut of Dave Warner, the local hermit. The newspaper also found humor in the fact that the unwitting traveler might be fooled the next day by the sign at Brookfield Jct. which would still say 'Danbury.’96 With the 1882 station gone, the unoccupied site at Danbury was now presumably available as the location of the new union station. A picture in Cornwall appears to show the open foundation where the HRR depot stood across from the NY&NE station.97 The photo is reproduced below at MP 10.7.3. [10.6.7] This reconfiguration of the HRR properties in March, 1889 left Danbury, once again, served by two railroads using just two passenger stations. Even with these changes, however, the situation was less than ideal. The reinstalled link only improved access from the north into the Main St. station. There was no wye, and no easy ‘through’ service via Danbury. Reverse moves and train and engine changes were still necessary. Some consists used the Hawleyville routing with its better north-south access. The HRR’s premier Berkshire Hills Limited Express was, on schedules as late as June 6, 1892, taking the Hawleyville branch on the way north to Pittsfield and using the Danbury link on the way south. The ultimate resolution would begin to materialize just days later with the Consolidated getting control of HRR stock, leasing it on July 1, 1892, and beginning to operate it and its lessors on November 1. As to the passing of the fifty-year-old HRR, the commissioners said simply that financial difficulties had doomed the road. They also reported that a new connection was in the works to better join the D&N and the HRR at Danbury.98 Whether this had been part of Stevenson’s plan is unclear but the result was the now-iconic loop track. Once in place, the commissioners said, HRR traffic for New York would go via Danbury and not Hawleyville. They also continued to talk of the new union station. J.M. Bailey says the Consolidated bought land, additional to what came with the HRR, on October 30, 1895 for the new White St. station.99 That new station, first mentioned eight years earlier, was not yet to be built for eight years more. [10.6.7] This is a close-up of the 1892 topographic map of Danbury. The end of the D&N line is at the red arrow. The 1889 link is in place at the blue arrow and the 1896 loop is not yet built. The single crossing of the old NYH&N, the rights to which the railroad commissioners had given to the BH&E, is shown at the green arrow where the NY&NE crosses the HRR. It was just east of this point where the HRR proposed in 1887 to reestablish the link to the D&N with an additional crossing of the NY&NE. One wonders why the HRR did not think of building it west of the existing crossover out of the way of the NY&NE. Had they done so, the Hawleyville link may not have ever been constructed. [10.7.1] For the time being, the Consolidated worked with what it had in the Hat City, using the aging Main St. structure it inherited from the D&N in 1892. The tables, meanwhile, were turning quickly against an NY&NE greatly weakened by the loss of its allied HRR system. 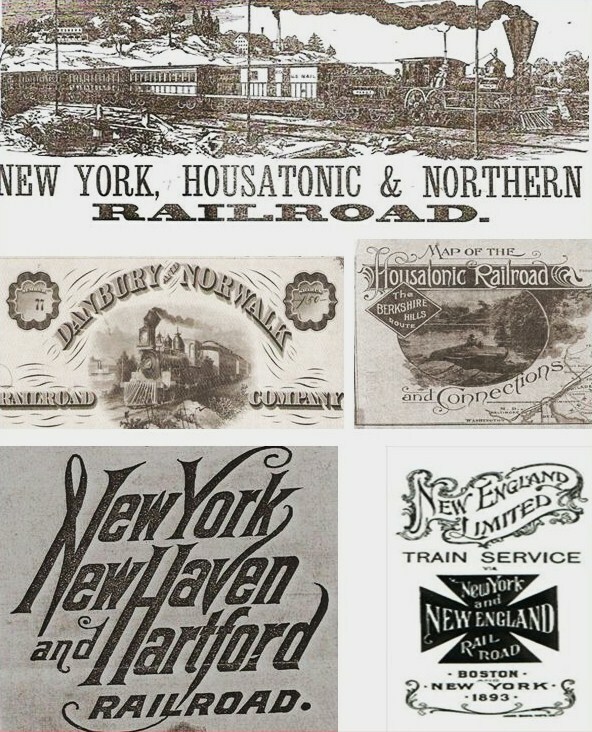 By 1895, the Consolidated was able to get majority control of the stock of the NY&NE and reorganize it as the New England RR, thus eliminating its last sizeable competitor in Connecticut, aside from the Central New England Railway. Rumors flew again about things to come in Danbury, including a new station on White St. In the meantime, in anticipation of that and to better utilize the NY&NE depot in its north-south service, the Consolidated executed the plan to construct a single, tightly-drawn, loop track to join the two depots and rail yard areas. This necessitated moving the old HRR freight house eastward away from White St. to allow the loop to meet the HRR track across from the NY&NE depot.100 The paper reports that work on the loop started on May 31, 1896, a Sunday, chosen as a time least disruptive to rail traffic.101 Within the day, the track leading to the Main St. station was shifted south and a new track was laid around the back side of the old D&N roundhouse. Trestle work, probably already in progress to cross the Still River here, pointed the new track to the corner of White and Canal Sts. where gravel was being poured. The entire project was completed within the week. New timetables went into effect on June 14, 1896. While the railroad was pleased with the new connection, it was still a complicated ballet of train arrivals, departures, and movements through the link and around the loop between the two stations. Undoubtedly, there was confusion for the public as well with trains using one station or the other, but not both. Generally, it appears that Pittsfield and New York trains left from White St. and trains going only as far as South Norwalk or New Milford departed from Main St.102 People were also upset by the deteriorating physical condition of the two stations. J.M. Bailey says that on February 19, 1894 the railroad was petitioned to replace the depot on Main St., later described in a newspaper article as a “rookery,” a term meaning a brothel, a roosting place for birds, or a hang-out for the poor, or some combination of the three.103 The NY&NE station, which was being shared by the two roads and where Consolidated tickets were being sold, was said to be only “slightly better.” Official city records show the common council ordering the superintendent of public works “to erect a fence across the sidewalk on Main St. at both sides of the depot of the N.Y. N.H. & H. R.R. to prevent a possibility of parts of that ancient structure falling on pedestrians”104 In spite of all this, both stations continued to be used until July 12, 1903 when the new NYNH&H White St. station, Danbury’s fifth, finally opened. Even with the Main St. station closed, schedules in 1904 show intricate train movements around the unique downtown, rail-loop trackage that still exists in Danbury today.105 The dismantling of the Main St. station began on July 8, 1914 and its passing was commemorated in the newspaper six days later.106 Tracks behind it were cut back to Ives St. and the only remaining tenant, the Adams Express Co., was relocated to a platform and shed built by the railroad along track 20 in the White St. yards.107 With a siting controversy reminiscent of the old depot itself in 1851, the Main St. property was ultimately given to the federal government to host the new city post office. Treasury Secretary William McAdoo's name is on the 1915 cornerstone for the building that stands there today. [10.7.2] This is the map from the 1897 Danbury city directory, possibly the first map to be issued with the directory. It is the first one discovered that shows the link as well as the loop in place, the latter having been just installed the year before the map was published. The blue arrow points to the D&N station; the red arrow to the NY&NE station; the brown to the 1896 loop; and, the yellow to the 1889 link. [10.7.3] This valuable panorama dates to somewhere between 1896 (the loop is in) and 1903 (the NYNH&H station is not yet built). What appears to be an excavation opposite the NY&NE station does not fit the footprint for the 1903 station. It may be the foundation for the 1882 HRR station that was moved to Brookfield Jct. in 1889, though it would be a little surprising if the excavation was left open until 1896 or later. Note the NY&NE water tank to the left and the single-story future 'Yellow Building' beyond the station. The old HRR freight house has been moved to the east to make way for the loop track. The people gathered have walked over from the NY&NE station, which was used to board trains for Pittsfield and New York after the NYNH&H got control of the NY&NE in 1895 and put the loop in the next year. [10.8.1] Not surprisingly, the installation of first the link and then the loop at Danbury quickly reduced traffic on the Hawleyville branch. With 16 grade crossings, no stations, few industries, and little traffic, the commissioners saw no point in opposing the NYNH&HRR’s petition for abandonment of the old D&N branch.108 The push for the elimination of grade crossings, then in earnest, was a primary factor. Moreover, the branch was no longer used as a route to the north or east now that the loop was in place at Danbury, and with the New Haven’s complete control of the NY&NE by 1898, there was no need for it as competitive freight cut-off to Norwalk either. The route, only four miles shorter than going via Danbury, was expendable. In place of it, the commissioners said that Litchfield traffic would simply use a new connection at Hawleyville to go directly to the Hat City via the old NY&NE route. June 1, 1911 marked the formal abandonment of the D&N’s Bethel branch.109 Little did the D&N know when it opened the branch in 1872 that it would come to play such an adversarial role in Danbury’s railroad history. The removal of the trackage, always noticeably redundant on railroad maps of the period, thus allowed the branch to fade into oblivion. The interplay of all these developments is perhaps now better understood in light of the events in Danbury. [10.8.2] With the link, the loop, and the 1903 station, major rail configurations ended in Danbury. The loop, a simple and serviceable solution, finally allowed traffic to flow reasonably well through the Hat City and into its dual railroad yard areas. The old D&N facilities became known as the Main St. yards, remnants of which were in use into the 1960s serving the Swift Brothers meat plant on the track to Ives St. The White St. HRR yards were increased in size by an extensive purchase of land in 1893 along Canal St., which was ultimately taken as railroad property.110 Augmented by the NY&NE parcels, this whole area went on to be the focus of rail operations in Danbury. The loop remained single-tracked apparently until the 1925 electrification of the Danbury branch.111 The double-tracking of the loop is reflected on the 1929 Sanborn map and that work probably filled in the two trestle crossings in the Still River meadow. The double-tracking of the NY&NE as the Maybrook line through Danbury, with the portion eastward to Berkshire Jct. just using the adjacent HRR track, had come in 1907.112 This was perhaps the final legacy of the railroad commissioners’ earlier rulings for side-by-side tracks. The NY&NE station had to be moved out of the way at this time. The NYNH&H relocated it behind the Danbury ‘Yellow Building,’ then its division headquarters, nicknamed for the railroad’s 1894 general office building in New Haven. The Danbury namesake had been the freight house of the former NY&NE and became the headquarters of the CNE in 1918. The NYNH&H had gotten control of the CNE in 1904, put the Maybrook line west of Danbury under its jurisdiction in 1912, and ultimately moved most of its staff from Poughkeepsie to the Hat City.113 Official 1915 valuation maps show Danbury facilities as owned by the NYNH&H and operated by the CNE, a situation that lasted until the CNE was merged out of existence in 1927. 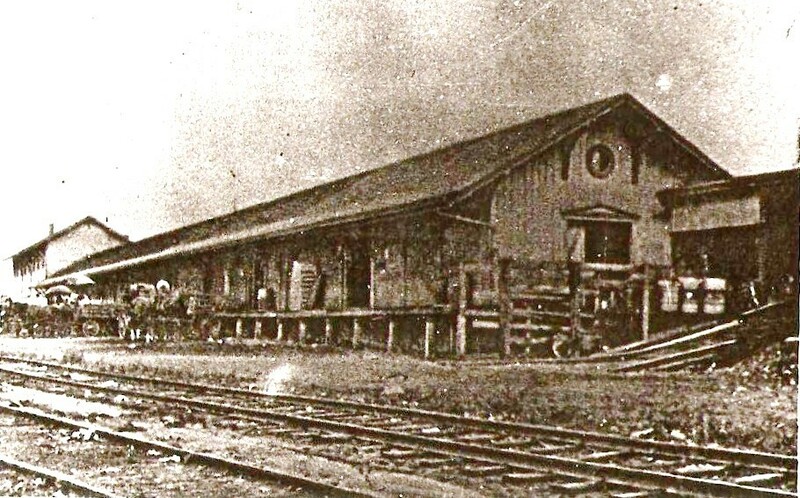 The 1881 NY&NE depot and freight house both still stand today north of the tracks. The property there, first leased and later sold to prominent local businessman and Danbury Fair promoter John W. Leahy, continues to be the home of Leahy’s Fuel.114 After Metro-North erected its own new station, operations ceased at the 1903 White St. station, which was renovated and reborn in 1995 as the Danbury Railway Museum. The museum’s operating turntable is on the site where the HRR relocated it over a century ago. [10.8.3] The 1903 station is an enduring symbol of several decades of railroad history in Danbury. While technically not built as a ‘union station,’ the original plan to unite the HRR and the NY&NE here seems to justify the term in an honorary sense. Even if built from 1892 to 1898 it would have served both the Consolidated and the NY&NE/NERR. 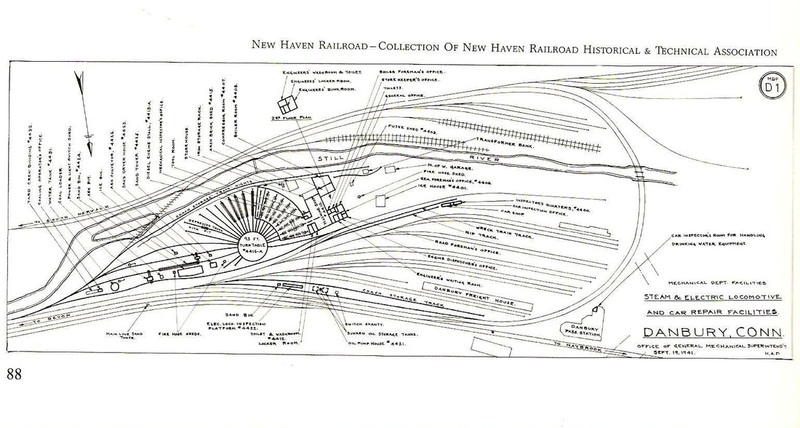 Perhaps the reason it did not come about any sooner was that the NYNH&H wanted to wait until, as was seemingly destined, it controlled and integrated all of Danbury’s railroads and facilities. It is quite ironic that these facilities were literally right next to each other all along. From Main St. to White St., the distance of barely a half-mile set the stage for a half-century of high drama in the Hat City. This might have been avoided had Danbury not declined its first offer of a railroad, the HRR itself in 1836. 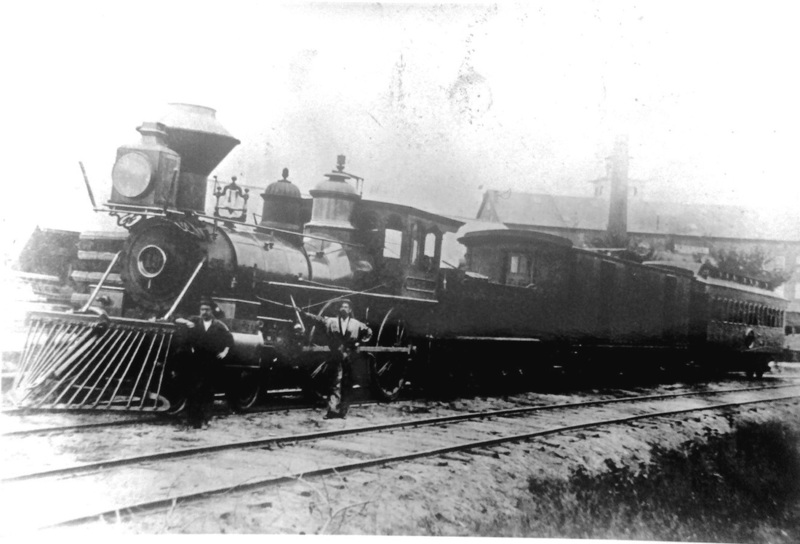 Shortly thereafter in 1845, the city of New Haven also turned away a railroad, the Naugatuck. Interestingly, in both cases the promoter was Alfred Bishop and the beneficiary was the city of Bridgeport, which became the terminus for the NRR and the HRR and experienced a twelve-fold population increase, the largest among Connecticut’s major cities, from 1850 to 1900, according to the U.S. Census. The further resulting coincidence was that, in 1868 when the NYH&N belatedly arrived in Danbury to link it with the HRR, the city of New Haven was belatedly financing the New Haven & Derby RR to win back some of the Valley traffic it lost with the NRR. The NH&D and NYH&N roads were kindred spirits. Both were short lines of but a few miles, afterthoughts, controversial and redundant in some ways in connecting points that already had rail service. Often maligned by contemporaries and historians alike, these visionary HRR step-children had significant roles to play in Connecticut railroad history and are worthy of reconsideration. Part of the ‘Little Derby,’ touted as a gateway to the west and made a reality by William H. Stevenson, indeed served that purpose as the first link in the NYNH&H’s storied Maybrook line. All that was ever built of the ‘Little Dummy,’ promoted by George W. Mead and secured for the HRR by William H. Barnum, became a gateway to the north, a link surviving today after some of the original HRR is gone. 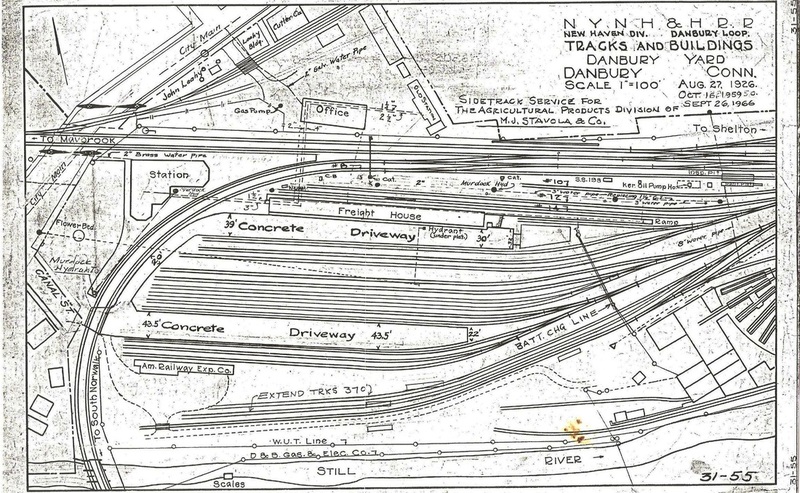 The NYH&N’s bold plan to connect Danbury to the ‘Empire City’ was the dream of abortive roads all the way up to the 1920s with the New York, Westchester and Boston RR and its Westchester Northern extension. Such a route may have supplanted the value of the D&N itself, the Hat City’s second-choice railroad. Had Danbury said yes to the HRR in 1836 and had the NYH&N been completed, this story would be quite different. Hindsight, as they say, is the best teacher and the histories of men, cities, and railroads are written as much about the risks not taken as about the ones that were. [10.8.4] The 1903 NYNH&H station, now the Danbury Railway Museum, today minus the passenger awnings seen here. This pristine shot looks like it was taken shortly after opening, the 'crowning achievement' of a half-century of high drama in the Hat City. Note the still-single loop track. Double-tracking for the loop would not come until 1925, probably in connection with the electrification of the Danbury line. The NY&NE, running behind the station, was double-tracked as the Maybrook line in 1906. [10.8.5] Danbury freight house, after the NYNH&H enlargement from its smaller dimensions in HRR days. Compare size in photo at MP 10.7.3. [10.8.6] Danbury facilities map in 1926 [left] and 1941 [right]. The turntable location is the same as 1882. This whole area contained the Danbury properties of the D&N and the HRR, both leased in 1892, as well as the NY&NE which the NYNH&H controlled by 1895 and purchased in 1898. All these roads were later merged at various dates. [10.8.8] The June 14, 1896 NYNH&H timetable for the Danbury and Berkshire divisions. This was the first one issued after the loop was installed and to reflect the changes at Danbury. It shows trains stopping at either the Main St. D&N station or at the White St. NY&NE station. The White St. shot [MP 10.7.3 above] shows people waiting to board a train across the track from the NY&NE station. January, 1883 for building HRR depots at Danbury and Stockbridge. #1. D&N Main St. station, 1852-1903; torn down in 1914. #2. NYH&N “shanty,” 1869; moved to White St, 1870; torn down? 1882. #3. NY&NE 1881 White St. station; now on Leahy’s Fuel property. #4. HRR 1882 White St. station; moved to Brookfield Jct. 1889; torn down? after 1934. #5. NYNH&H 1903 White St. station; Danbury Railway Museum since 1995. Dodd Thomas J. Dodd Research Center, University of Connecticut, Storrs. WCSU Archives and Haas Library, Western Connecticut State University, Danbury. Annual Reports, Brochures, Maps, Timetables. Various railroads, various dates. See the Plan of Danbury foldout map. This single map is also at DPL. Blakeslee, Philip C. Lines West: A Brief History. 1951. Self-numbered text pages are from the Camm Historical Series pamphlet. Wednesdays. CHS, CSL, DPL; WCSU has the complete run. on the wrong side of the NYH&N track. The plate is correct. [JF] The Jeffersonian. March 14, 1860 - March 5, 1870. Weekly. Purchased by the Danbury Times and merged with it to create The Danbury News. Sanborn Fire Insurance Maps. 1885-1947. DPL has 1904 Danbury maps; CSL has entire set online; on-site access only. NOTES ON BERKSHIRE JUNCTION We thoroughly enjoyed, and learned quite a bit, from Casey Cavanaugh's 2010 article "Berkshire Junction" in the NHRHTA's Shoreliner 32.1 but some clarification of historical detail seems to be in order and perhaps will invite reader input that is always welcome at TCS: 1. 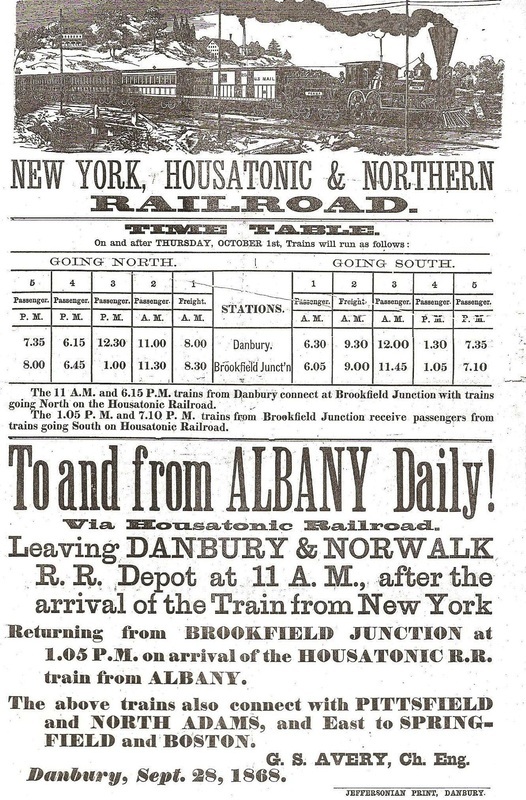 On page 17, the article says that the New York, Housatonic and Northern RR was obtained by the Housatonic RR in 1872 and this allowed a "connection" in Danbury. The lease did occur in 1872, but the track connection, put in on November 26, 1867, was long gone, out by 1868, as best we can tell. Its removal, which Peter Cornwall [In the Shore Line's Shadow, p26] notes, shaped the history of Danbury's railroads for the next 20 years. See Track 10, MP 10.2.0, 10.2.7. The permanent link would not come until 1889, a short time after the HRR leased the D&N late in 1886 and the loop would not come until 1896 when the NYNH&H put it in. So, it is not correct to say there was a link in 1872. 2. Also on page 17, it says that the NY&NE shared track with the HRR. All the many accounts we have seen say that the NY&NE built its own line (and tunnel) and paralleled the HRR to the north through Hawleyville and crossing to the south side of the HRR just east of Hawleyville at a point we think we have seen called Hawleyville Jct. The NY&NE continued west to Danbury and the HRR veered north to Brookfield Jct. at Hobarts. See the Edwin B. Storrs Newtown article maps in Shoreliner 11.1. Click here and here for the relevant 1892 topographic maps that show the side-by-side rights of way but and no track shared by these independent, competing companies.